As I write this I am currently employed by Manpower Services and since November 2006 I have been engaged by Pfizer at the Terre Haute Exubera plant developing their intranet, SharePoint sites, developing online applications and writing material for their electronic bulletin board system. It's been a great time working with fantastic people but on Thursday, 18 October 2007, it all changed. I'm no expert but it seems important to me to write my own perspective of what happened. We are announcing our financial results for the third quarter today and I want to give you my perspective on our quarterly performance, our decision to stop further investment in Exubera, and the progress we are making to put our company on the right track. The operating performance of our business was solid this quarter. We are making good progress on streamlining our operations and reducing our costs, and many of our newer products are delivering strong financial results, with Lyrica, Chantix, and Sutent exceeding our expectations. We are on track to achieve roughly the same revenues as last year and better adjusted earnings. That’s a significant achievement in light of the loss of patent protection on major products like Norvasc and Zoloft, as well as the intense competition facing our biggest product, which the Lipitor team is addressing with creativity, energy, and focus. But, at the same time, it’s important for us to be realistic when a product is not meeting our expectations or those of our customers. That is the case with Exubera. For more than a decade, talented colleagues across Pfizer have been working hard to bring Exubera to patients. Despite the best efforts of our R&D, medical, sales, marketing, and manufacturing colleagues, it has failed to gain acceptance among patients and physicians, even though it remains an effective and safe diabetes treatment. For this reason, we have decided to exit the product and make no further investments either in Exubera or in a second generation inhaled insulin device. In connection with this decision, our third-quarter financial statements reflect a pre-tax accounting charge to earnings of $2.8 billion. Over the next three months, we will work with physicians and patients who supported this product to help them transition from Exubera to other treatment options. We plan to redeploy colleagues who are currently working on Exubera in commercial, medical, and R&D operations to other areas, including important late-stage development projects and additional field force support for other inline medicines. There will be no reductions in the field force as a result of this decision. Opportunities for redeployment in manufacturing are, unfortunately, much fewer and will depend on the ultimate role for our two major manufacturing sites in Terre Haute, Indiana, and Frankfurt, Germany. We will quickly explore alternatives for these sites and colleagues in consultation with Works Council and other appropriate authorities. I want to emphasize that Pfizer remains committed to developing our own new treatments for diabetes, which is an area of huge unmet medical need. Our R&D portfolio spans the breadth of the diabetes continuum, from genetic susceptibility at birth to the onset of devastating complications. We have candidates in development with a number of different approaches, and diabetes will also remain a core area in our business development strategy. The decision to exit Exubera was a tough one — but it was the right one. We are investing our resources in those programs and products that offer the greatest opportunities for creating value. In light of its financial performance, Exubera simply doesn’t meet that standard. We will continue to exercise discipline in how we allocate our capital. Beyond this, we are continuing to make the tough decisions and take the necessary actions to address our challenges and seize our opportunities. We are making progress in increasing our productivity, in putting strong leaders — from both inside and outside the company — in key positions, and in improving the operating performance of our more focused and more sharply accountable business groups. I have been heartened by the enthusiasm so many colleagues across the company are showing for these changes. After traveling with our new R&D leadership team — Martin Mackay, Corey Goodman, Rod MacKenzie, Nick Saccomano, and Briggs Morrison — to our R&D sites around the world last week, I can tell you from first-hand experience that the colleagues we met with are eager to advance their primary goal: To generate new products, and a lot of them, as fast as possible. The strength of our Phase II pipeline means we could have more Phase III starts next year than at any time in our history, including treatments for rheumatoid arthritis and cancers of the lung, breast, prostate, and liver. Our new biotherapeutics and bioinnovation center in California will create new opportunities to discover, license, and acquire more new product candidates that we can put into development. Both independent of and interdependent with PGRD, the center will bring an important new dimension to our scientific work. This is just one example that tells me we are beginning to create a very different company with a new and positive spirit. We have a realistic appreciation of our challenges. But we are working with a sense of urgency and a single-minded focus to improve every aspect of our company — from the way we work, to the way we make decisions, to the speed with which we operate. As always, I remain grateful for your hard work and commitment. That was it, this was the first that I knew that anything was wrong. The day production shift had arrived at 6am and at 8:45am they had a meeting with the plant manager, Frank Foley, who explained that production was being stopped immediately and that they will still be paid for an undefined period of time and that they should go home. The Pfizer Lincoln, Nebraska plant had seen some of my work on the Terre Haute intranet and electronic bulletin boards and wanted the files so I zipped them up and sent them to them which was probably the last normal thing I did at the plant. After that I was busy for a while writing pages for the help phone numbers for Pfizer employees, meeting dates and times and other information that people needed to know. I had files on my computer that I thought needed to be saved so wrote those out to DVD and gave them to my boss, emailed Manpower in case they had not heard what had happened, sent another email to my wife, put all my personal stuff in a box and left the plant around 1pm. The next day, around 11am, I had a phone call from Manpower saying they wanted me back at the plant. The drive back to the plant was miserable, far worse than the one from it the day before and I got there around midday and was told I was to stay on for an unspecified time to help with plant communications. Apart from the managers and some admin staff the place was practically deserted. I think most of the people who were there were inside the production building. Apart from all the equipment, there was still insulin in there that needed to be stored properly whilst retaining the building's integrity. The production areas are "clean" and until it is decided what will happen to it, it has to stay that way. All the normal "traffic" precautions are still in place - for example, our sister site still makes Penicillin and there are rules about transferring people and equipment between the two sites. After leaving the Penicillin plant you still have to go home, shower and wait 8 hours before being allowed back in the Exubera side. I stayed in the plant until 4pm then left for home. It wasn't until around Wednesday of the following week that the place stopped feelng like someone close had just died. America built several plants for the large-scale production of biological weapons. In the 1940's, one was the Vigo plant, just outside Terre Haute, Indiana. Around 500 people worked at the $8 million plant which used 300,000 lbs of glucose or cerelose, 625,000lbs of corn steep liquor, 1 million lbs of yeast, 50,000 lbs of casein, 20,000 lbs of peptone and 190,000 lbs of phosphates a month. This was all used to produce over 500,000 anthrax or 250,000 botulinus bombs a month. The plant was ready to go into full scale production in early 1945, but with the end of the war it was leased for the production of antibiotics, it could have been converted back into war production inside of three months. 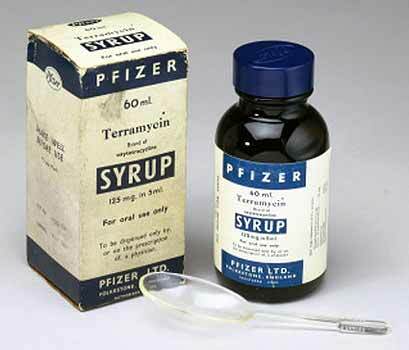 The company acquired the land in 1947 was Pfizer and it opened on 1 January 1948 for the production of penicillin and streptomycin under the leadership of John E. McKeen who on 27 September 1949 became president of Pfizer. (National Academies Press) competitors were soon producing penicillin and so the price dropped, Pfizer started looking for newer antibiotics. Following 20 million tests on 135,000 soil samples from different locations around the world, Pfizer introduced the new antibiotic Terramycin, the first medicine discovered by systematic Pfizer research. (Pfizer Canada) The soil sample that contained this new wonder drug, oxytetracycline, actually came from soil around the Terre Haute plant. 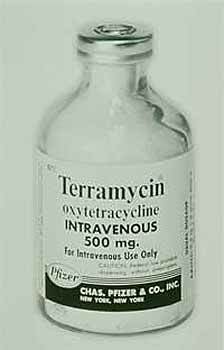 Terramycin became the first drug sold in the United States under the Pfizer label. It was approved by the FDA on 15 March, 1950.